On Saturday, September 14, 2013, I presented my session "Cure your sysadmin addiction" at SQL Saturday #232 in Orlando at Seminole State College. I can prove it. I have pictures. On the left, I'm wearing my speaker shirt "Bubba-style". Once again, getting the projector to play nice with my laptop proved to be difficult. 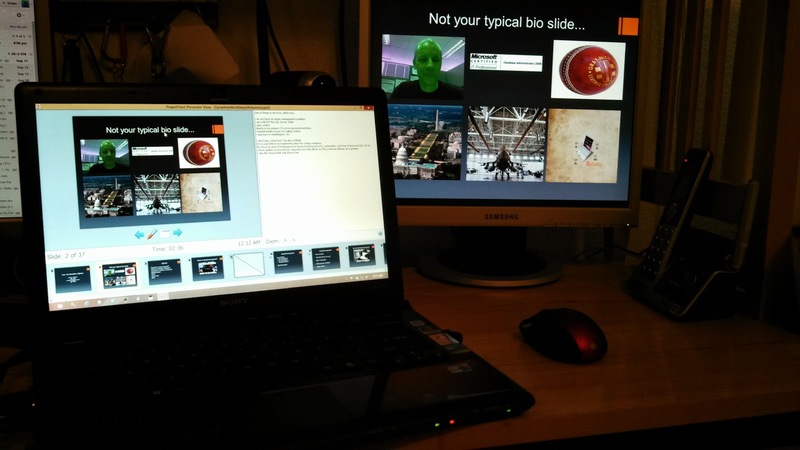 I could not get PowerPoint Presenter View to work correctly. Running Windows 8 as a guest OS in VirtualBox on a Ubuntu Linux 12.04 LTS host should not be this difficult. Should it? Why does this always happens when Rob Volk is in the room? That's Rob on the right. I did test my setup prior to my talk. It worked at home. Here's proof. I think I need to run the Guest OS in Fullscreen mode for it to work correctly. It might have been a resolution issue also. 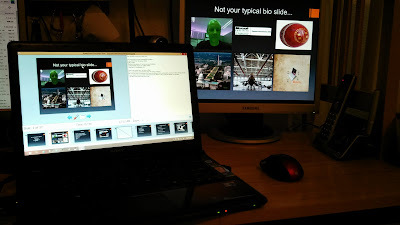 Adjusting the resolution I'm sending to the projector may have helped. I'll keep that in mind next time. Despite the issues with the projector, I did get through my entire presentation and still had time to answer questions along the way. It was my third time presenting this session so I was pretty pleased I remembered most of my notes. If you need another good reason to manage sysadmin strictly, consider this. Another great job by Karla Landrum, Kendal Van Dyke and the team in Orlando. 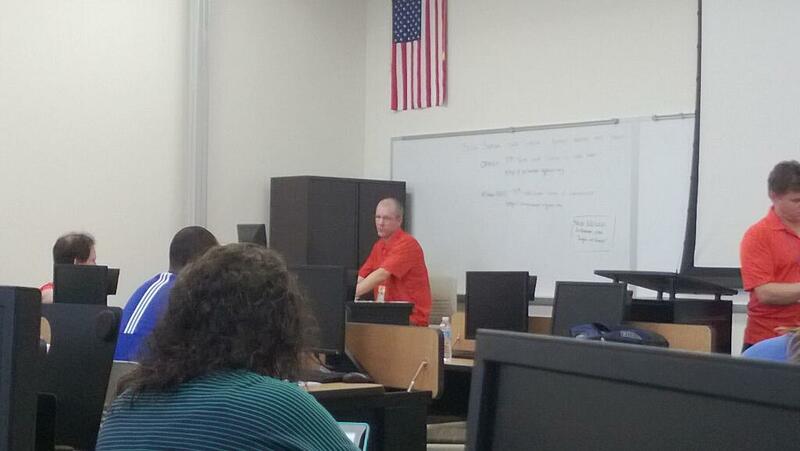 Seminole State College is one of the best SQL Saturday venues. Keller's BBQ provided a great lunch again with the speakers serving up the goodies. I'm glad the speaker shirts were the standard polo. I can wear it to work although I could be mistaken for a Florida Gators or Clemson Tigers fan. I'll get a chance to do my talk again at the Tampa SQL User group meeting at the end of this month. Hopefully, I can get the pesky projector working. 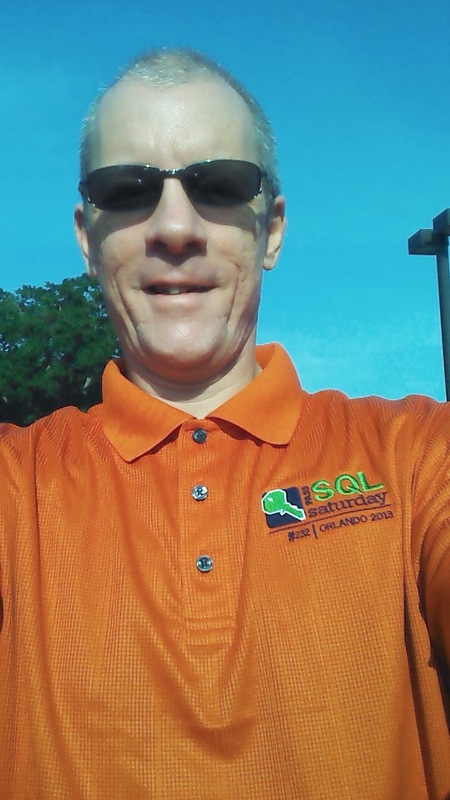 SQL Saturday #232 Orlando - I'm speaking! 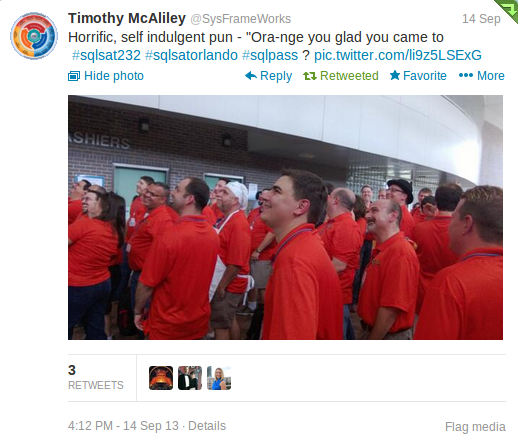 I'll be speaking at SQL Saturday #232 in Orlando, FL on Saturday, September 14, 2013. The information for this always outstanding event can be found here. 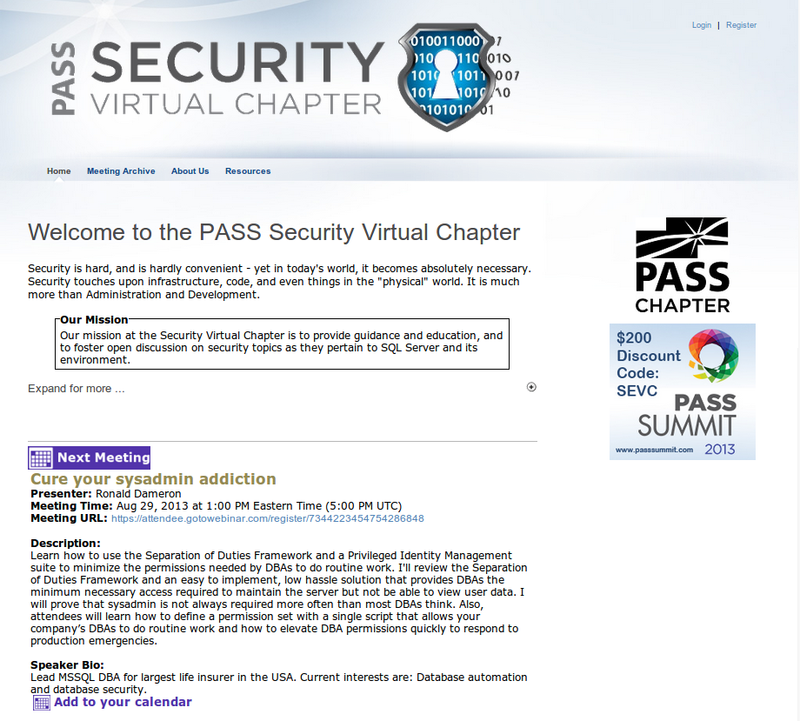 I will be presenting "Cure your sysadmin addiction". If you have the requirement to reduce DBA permissions in your Production environment due to Risk and Compliance mandates, you should attend. This will be my third time speaking in Orlando and my eleventh SQL Saturday overall. SQL Saturdays are an extremely inexpensive way for IT Pros to gain an edge in a competitive job market and to develop a network that can help you at your current job or find that next job. 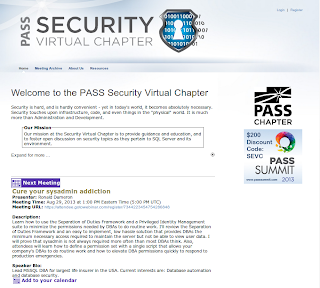 I had the pleasure of presenting for the new PASS Security Virtual Chapter on August 29, 2013. My presentation "Cure your sysadmin addiction" describes the fundamentals of Separation of Duties, reviews SQL Server fixed server roles and granular permissions and the steps I took to reduce DBA permissions in our Production environments to satisfy a mandate from the management and our IT Risk and Compliance group. If you missed it, the session was recorded. Please forgive the audio difficulties at the beginning. Once I dialed into the session, it went smoothly. Thank you to K. Brian Kelley, Argenis Fernandez, and Robert Davis for the opportunity.